“Call on God, but Row Away from the Rocks” and similar | Real.Good.Work. — Attribution unknown. * But why worry about that if the words are wise? *For many years, I thought of the first quote as an “American Indian” proverb, but while doing some research for this blog post, I discovered that it may be more properly attributed to the Indian subcontinent, rather than North America. The second quote has been described as a “Muslim Saying” and has also been attributed to the Prophet, as collected in the Hadith; however, I have not found an exact reference. The third quote is attributed to Hippocrates, but Wikiquotes indicates that it is (as of yet) an undocumented quote. 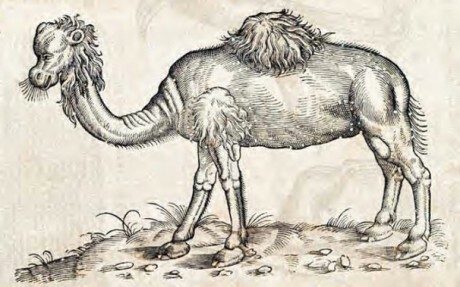 Camel illustration from The history of four-footed beasts and serpents… by Edward Topsell, 1658. Public Domain. Kindly shared by the University of Houston Library’s Special Collections. “Pray to God, but row away from the rocks” was Hunter Thompson – at least as quoted. Don’t know if this helps.